Topic: Keeping a Gun on the Nightstand? 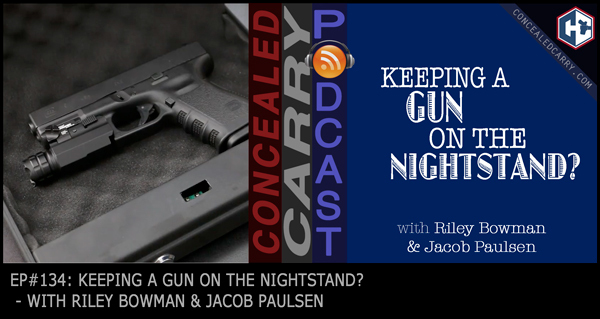 Today Riley and Jacob talk about different ways and strategies for keeping your gun handy yet secure on or near the nightstand for quick access while sleeping. Jacob spent some time evaluating and comparing different quick access safes including how quickly you can deploy and even compared this to just keeping the gun on the nightstand without any sort of safe being used. The problem with this? Security, especially with little ones around, but we also need to consider security from burglaries and break-ins. Hope you enjoy this episode today! One Response to Episode 134: Keeping a Gun on the Nightstand? My suggestion to all is that choosing a place to have your firearm, while sleeping, should be one of randomness. I am retired after 42+ years as an LEO. Foolish though it may sound, I move my nighttime handgun around, on a regular basis. Sometimes on the nightstand, and sometimes in it’s drawer. Sometimes under the pillow, sometimes under the covers (I am widowed so do not have a wife to complain about it being uncomfortable near her feet or hips). My point is that you should not be able to access your firearm unless you are fully awake and able to think about where it is and what you are doing. By moving it, periodically, you must think about it. I do admit that I have an advantage over most folks, in that I am virtually always alone, so if someone is in my house at night it is a certainty that they have not been invited. Still, I choose to move the gun, now and then, to make certain that I am awake and thinking before I have my hands on it.